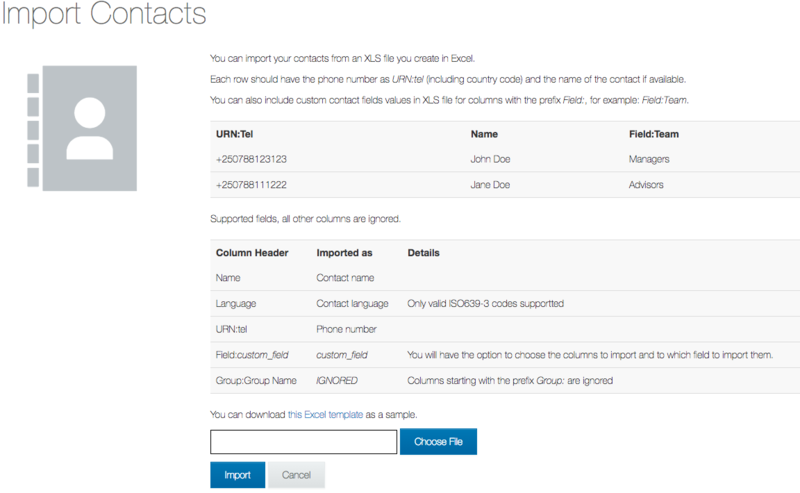 Importing contacts allows you to add entire groups of contacts to our platform using a simple XLS (MS Excel) spreadsheet. Address columns corresponding to the addresses each contact may contain (a Phone column containing each contact's phone number in E164 format; and/or a Telegram column containing each contact's Telegram identifier; and/or a Twitter column containing each contact's Twitter handle; and/or an Email column containing each contact's email address). Once imported, our platform will display your contacts' phone numbers without the country code prefix. A Name column that contains the first and last name of each contact. (Conditional) A UUID column containing the universally unique identifier for each contact you import. This column may replace the Name column, and is necessary when importing a spreadsheet with the intention of adding a new address or address type to your contacts. (Optional) A Language column representing each contacts' preferred language that contains the ISO 639-2/B standardized nomenclature to classify the languages you're including. (Optional) Any number of additional columns corresponding with custom attributes* (contact fields) containing contact field values. Note that column names are limited to 36 characters, don't support special characters, and may not start with a number. Additionally, when manually adding only a date value to a contact field, we will replace the corresponding time value with the time at which you updated the field. 1. Navigate to the contacts tab. 2. Click the "Import Contacts" button. 3. Download and edit the template we provide (or choose a your own file) and upload it using the "Choose File" button. *Note: Be sure that you only use supported fields for your Column Headers in your spreadsheet. For example, if you want to add a registration date, use the Column Header "Field:Registration_Date"
*Note: If you don't see the Contact Field you want to use, such as "Registration Date", that means you have not created that custom contact. Find out how here. Contact addresses can be added via an import, so long as the UUID column contains the UUID(s) of the contact(s). Contact UUIDs can be obtained by exporting your contacts.